PARIS (AFP) – French Finance Minister Christine Lagarde is planning a charm offensive to convince emerging economic powers like China and Brazil that another European should head the IMF, sources said Thursday. AFP - France's Finance Minister Christine Lagarde (C) arrives upon a press conference to announce her candidacy to head the International Monetary Fund at the ministry in Paris. Lagarde, one of two declared candidates for the IMF job vacated by the disgraced Dominqiue Strauss-Kahn, "could go in the coming days to China and Brazil," said one source in Lagarde's entourage. Details had yet to be agreed, the source added. Lagarde could also visit other BRICS states -- the collective name for Brazil, Russia, India, China and and South Africa -- "to make herself better known, to explain her candidacy and lobby," the source added. US Secretary of State Hillary Clinton meanwhile said on Thursday that Washington had not yet made its choice on the IMF post, although "unofficially" she would welcome a woman in the job. Lagarde announced her candidacy on Wednesday after her countryman Strauss-Kahn resigned from the International Monetary Fund to fight sexual assault charges, which he denies, in the United States. She has run into strong resistance from the major developing countries who think it is time they got a say at the top of one of the global economy's most important institutions. China said on Thursday that the choice of a new IMF chief should be based on "openness, transparency and merit, and better represent emerging markets and better reflect changes in the world economic structure." China's foreign ministry said it had "noted" the nomination of candidates for the post of IMF managing director but a statement did not directly address Lagarde's candidacy -- even though Paris claimed on Tuesday that Beijing would back her. Lagarde told the Wall Street Journal in an interview on Thursday that she was prepared to visit China, as early as Sunday, to drum up support for her bid. "China, Brazil and India are an absolute necessity," Lagarde said. If the developing countries oppose another European as head of the IMF, they have up to now failed to agree a candidate of their own, with some critics seeing their opposition as just sour grapes. On Thursday, however, Indian Finance Minister Pranab Mukherjee said he was "in touch with some of the finance ministers of developing countries and emerging economies ... We are trying to consolidate our position." On Wednesday, Indian Prime Minister Manmohan Singh called on developing countries to help reform the IMF while on Tuesday, the BRICS IMF directors said Europe's grip on the top post "undermines the legitimacy of the Fund." South Africa insisted on Thursday that the next IMF chief should come from the developing world but added that it had not discussed potential candidates. The head of South Africa's national planning commission Trevor Manuel has been floated but Mexico put forward its central bank head Agustin Carstens earlier this week. Thai Finance Minister Korn Chatikavanij said Thursday that Asia had "a number of potential candidates," adding that IMF head should be selected "regardless of nationality." 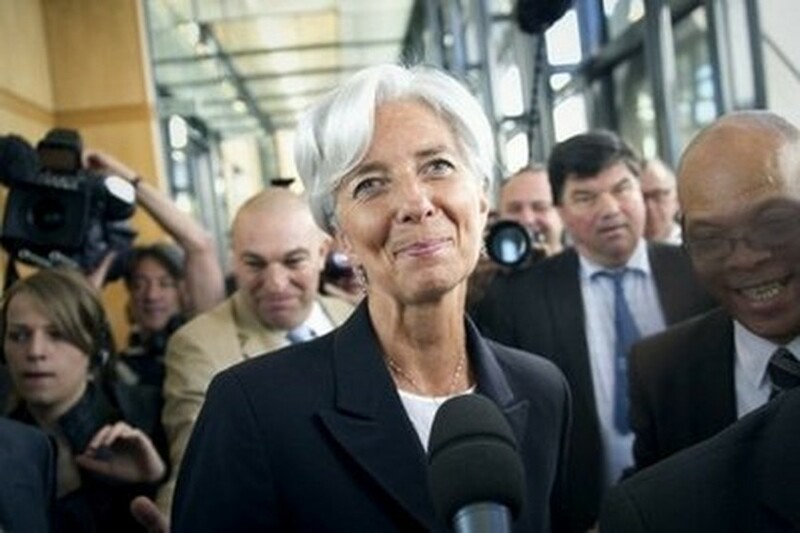 Germany, France, Britain and Italy have all backed Lagarde. US Treasury Secretary Timothy Geithner on Wednesday called Lagarde and Mexico's Carstens "very credible" candidates, without endorsing either, adding that "there may be others to join them." By a convention dating back to its 1945 founding, the IMF has a European head while an American takes the top job at its sister body, the World Bank. Currently, European nations hold close to a third of the voting power at the International Monetary Fund while the United States has nearly 17 percent. Asian nations hold around 20 percent, with the rest held by other countries. The IMF has said it would like to make a choice by the end of June, based on consensus among the 24 executive board directors, or possibly by a vote. Strauss-Kahn resigned last week to face sexual assault charges in New York.